Outdoor monocular, 12× high power prisms provide maximum HD image clarity. The target wide lens of the 50 mm full multi-layer coating green film provides a bright and broad field of view. BAK4 prisms and optical coating technology provide the brightness and color fidelity you need. Hunting, camping, hiking, travel, outdoor, surveillance, Watch concerts and ball games, etc. 1, single eye 12×50 zoom. 2, multi-coated optics ensure superior light transmission and brightness. 4, night vision technology: it will help you see things in low light, but it will not help you see things in the dark. Samsung GALAXY S8, S6, S6 Edge, S5, Note, LG, Sony, and almost all other smartphones on the market. 1. Do not look directly at the sun through the telescope, otherwise, it will hurt your eyes. 2. If it has not been used for a long time, please put it in a dry place. 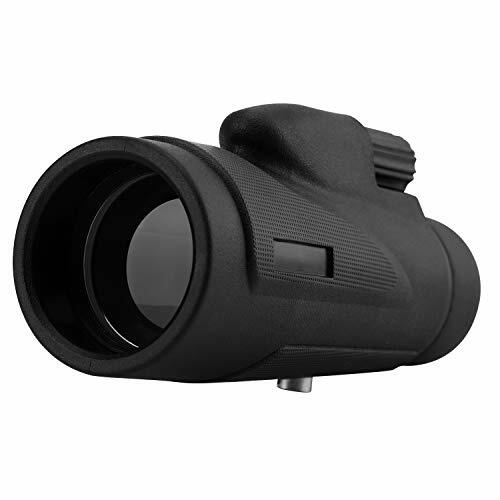 POWERFUL MONOCULAR : Full 12× magnification and 50mm diameter wide lens binoculars for the greater field of view (430 feet, 1000 yards) for sharper, brighter images. Suitable for outdoor travel, adventure, migration, hunting, camping, bird watching, concerts, ball games, and landscapes. BUILT-IN LARGE BAK4 PRISM AND FULL GREEN FILM-COATED LENS : strengthen the key functions of the monocular Scope, Multi-coated optical glass material to ensure its super light transmission and brightness, making the field of view brighter and clearer. The low-lighting night vision Monocular design helps to see things in low-light environments. EASY TO OPERATE : compact monocular design, easy to operate with one hand. Its a high definition Monocular telescope, The eyecup can be adjusted to move up and down quickly for optimal viewing. DURABLE RUBBER OUTER ARMOR : the outer material is rubber polished, strong and impacts resistant while ensuring a comfortable grip and durability. The waterproof and anti-fog design of life makes Monocular 12x50 work well in the daily use environment. THE PERFECT ACCESSORIES : With a universal smartphone monocular adapter, it is compatible with almost all models such as iPhone, Samsung, LG, Google, etc.. Inaddition, there is an expandable alloy tripod for monocular that is sturdy and stable. If you have any questions about this product by GuLangTech, contact us by completing and submitting the form below. If you are looking for a specif part number, please include it with your message.